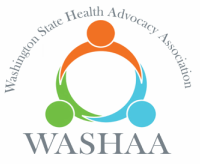 The Washington State Health Advocacy Association (WASHAA) is a nonprofit organization dedicated to promoting health advocacy in Washington State, empowering patients to improve health. Read our most recent Newsletters ﻿Here﻿. We require a double-opt-in, so please check your email and confirm your subscription to WASHAA emails. Use Smile.Amazon.com to make your daily Amazon purchases. Who Is A Health Advocate? A Health Advocate is an individual who provides direct and personalized services to a patient and/or family members as they navigate the healthcare system. Check the WASHAA Health Advocate Directory for professionals offering advocacy services in medical, insurance, legal and older adult care. Browse their profile and contact them directly. Don't forget to mention you found them on the WASHAA website! Have you ever come across a nurse navigator while in a medical situation? Understanding the role of the nurse navigator can have a tremendous impact on the patient. WASHAA Chair Robin Shapiro talks about our organization's mission and vision, and introduces the exciting initiatives from their 1st Annual State of the Industry Meeting! Ready for more health advocacy news from WASHAA? Please sign-up for our email list to be directly added!